Built in the same spirit as a luxury mega yacht, the new Marine Mega Yacht watch, crafted in platinum in a special edition of only 30 pieces, is regulated by a flying tourbillon equipped with a cage modeled on a latest-generation ship's propeller. Intimately linked to the concept of the mega yacht, this timepiece boasts a 3D "grand feu" enamel dial, reminiscent of a ship's bow plowing its way through the ocean waves. A precise representation of the Moon with an ultra-detailed surface sits across from a sophisticated tide indicator, while an anchor attached to the windlass at 12 o'clock raises and falls to indicate the power reserve. 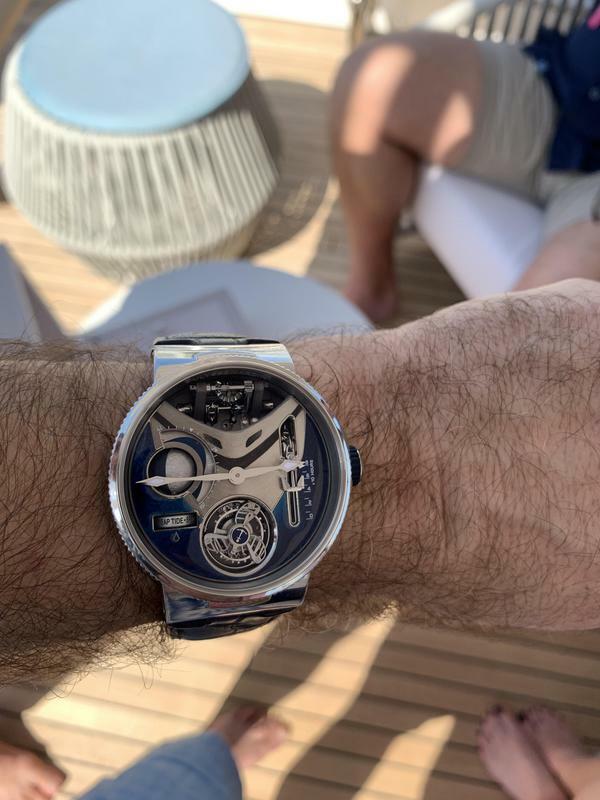 February 2019, Miami Yacht Show An extension of the Marine Grand Deck Tourbillon watch launched by Ulysse Nardin in 2016, this new complication model christened the "Marine Mega Yacht" follows the tradition of the Marine collection and the passion for all things nautical that has been a constant feature of the Ulysse Nardin Manufacture ever since its foundation in 1846. While the earlier model celebrated the world of sailboats and luxury liners, this new Mega Yacht creation is dedicated to the owners of these prestigious, contemporary vessels. At the very heart of this exceptional watch, they can rediscover some of the most characteristic features of their boats, carefully crafted to take on the seas of the entire world. This superlative creation is a perfect allegory of a voyage by sea and epitomizes the contemporary spirit of nautical luxury, masterfully embodied through an avant-garde watch design that could only have been created by Ulysse Nardin. Crafted in platinum and with only 30 pieces in the entire world, this authentic flagship of the watchmaking fleet is created by a Manufacture that has specialized in making timepieces for sailors since 1846. Its generous dimensions are displayed on the wrist with a playful elegance. With its diameter of 44 mm, this is an instrument specially conceived for the modern adventurer who models himself on Captain Nemo. Magnificently reproduced in 3D, the bows of a luxury vessel seem to surface from a pool of white gold as though it were emerging from the mist, and cuts through a sea of "grand feu" enamel on a wave of foam portrayed with astonishing realism. To guarantee perfect timing, this construction is regulated by a flying tourbillon. To ensure the watch is firmly anchored in the nautical world, the cage of the flying tourbillon is decorated with a propeller, its blades specially honed to guarantee the highest level of performance for latest-generation yachts. And since every detail counts, the hands, with their design inspired by the venerable marine timepieces that the Manufacture has always supplied, move majestically above this scene, like the lamps of lighthouses or buoys floating on the horizon out at sea. Aestheticism is not an aim in itself, however far from it. 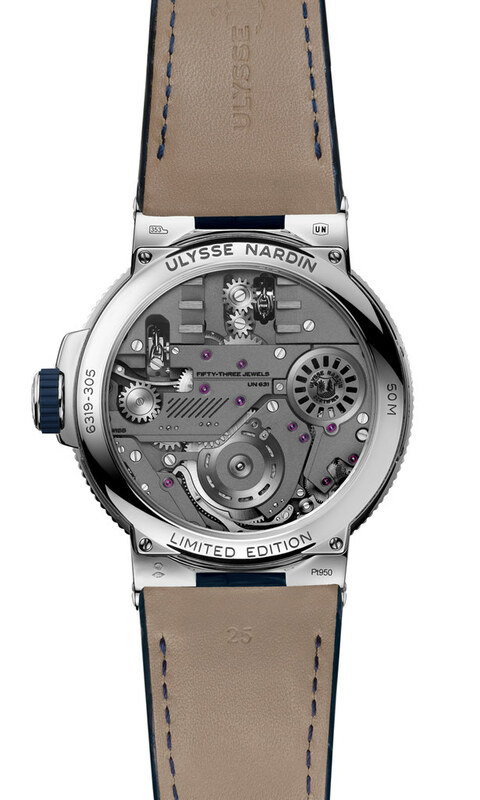 The Ulysse Nardin Manufacture has always been keen to provide technical solutions for sailors' necessities. 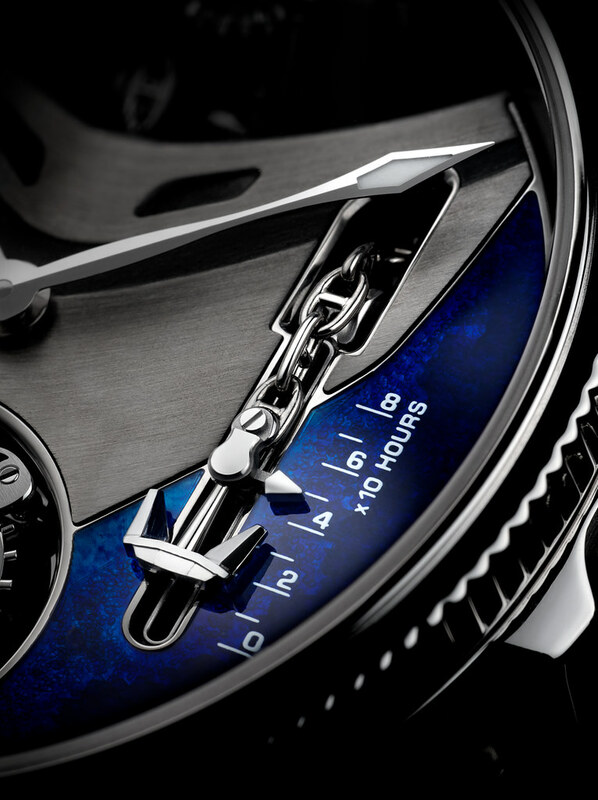 With the Marine Mega Yacht, Ulysse Nardin has introduced a revolutionary information display designed to optimize yachts' choice of anchorage points when mooring alongside the shores of the world's oceans. 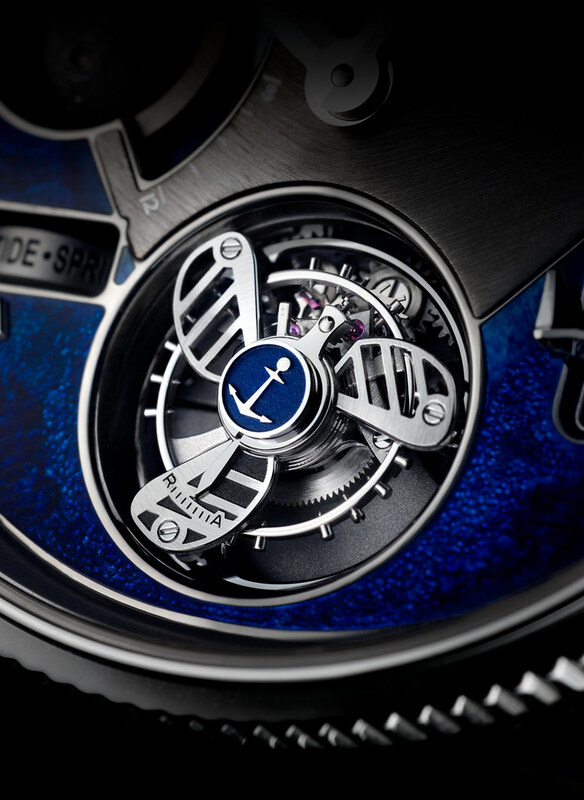 To craft this watch's manually wound Manufacture mechanical caliber (regulated by a tourbillon), Ulysse Nardin has used its very best watchmakers, who have worked with supreme commitment alongside those from the Christophe Claret manufacture, a brand universally recognized for designing innovative watch complications in its workshops. Innovative and completely visible through its transparent case-back, the movement is designed to resemble the engines found in a vessel's engine room. 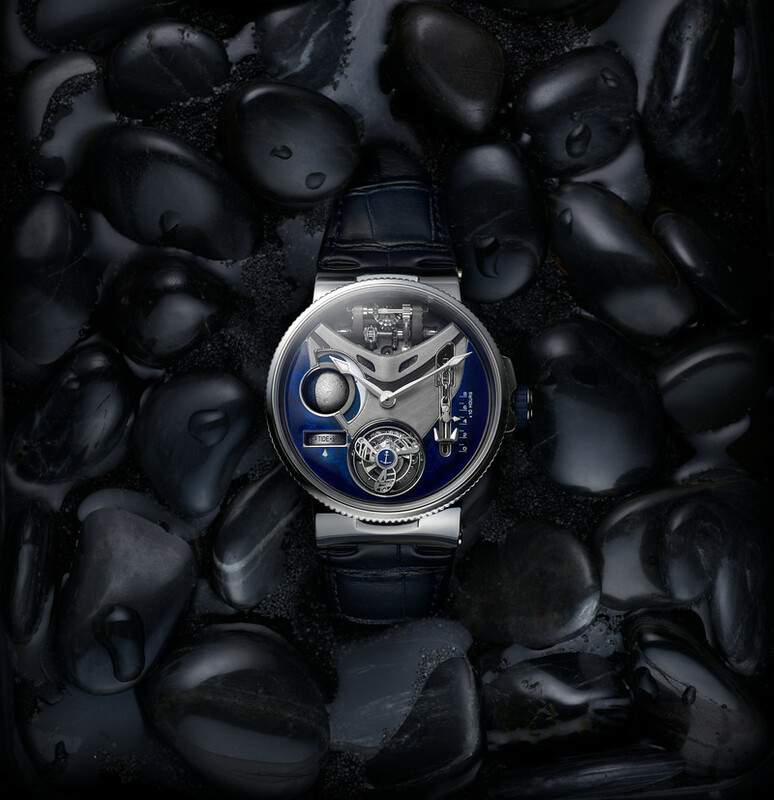 This powerful beating heart of the watch has a diameter of 37 mm, features 504 components, and is wound by hand. It guarantees a power reserve of 80 hours at a cruising speed of 21,600 vibrations per hour, with the tourbillon moving at 60 rotations per hour (or one rotation every 60 seconds). Its first role is to provide an analog time display, giving a three-dimensional presentation of the phases of the Moon. It contains a mechanism that displays the height of the tides in real time in relation to a specific location, in addition to indicating the seasonal coefficients. Once the mechanism has been adjusted by the action of the winding-crown, the position of this is measured in a window opened up in the side of the watch-band in the same way as the screen of a Chadburn Telegraph. Because watchmaking is above all an art form, the anchor features a contemporary design fashioned in the form of a plowshare, and is linked to the chain by an anchor ring. Although this may appear to be entirely decorative, the anchor chain actually moves in response to the movements of the winding-crown so as to indicate the power reserve. Keen to be as realistic as possible, Ulysse Nardin has perfected an authentic miniature windlass, visible at 12 o'clock. Through the action of a set of wheels in contact with the winding mechanism, the windlass turns to simulate the raising of the anchor, even when the winding process has been fully completed. 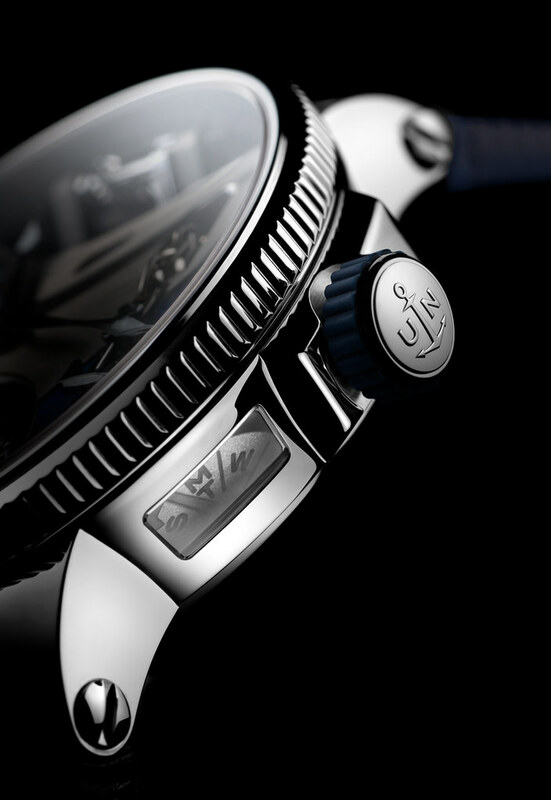 Now let's talk about the anchor, which features the historical logo of the Ulysse Nardin Manufacture. This piece of equipment, such a vital element for the safety of a ship and its crew, appears in profile. It is linked by an impressive chain that upon emerging from the mooring chock, seems to be visually linked to the prominent windlass located at 12 noon on the dial. Every element counts in this timepiece designed for watch-lovers with exceptional toys wishing to always keep a jewel at their side that will remind them of their very own flagship. Since the use of GPS systems and other navigation aids dispenses with the need to calculate longitude at sea with a sextant and a marine chronometer, Ulysse Nardin's team of researchers focused on what was needed for the modern Mega Yacht owner instead. In the case of this model, the answer was to include a display of the phases of the Moon with the aid of a precise 3D reduced-size representation of Earth's satellite. In order to make a special impact, the surface is reminiscent of the Moon's actual surface, reproduced using an ultra-precise engraving. It is made up of two half-spheres: one treated in blue PVD (for the period of the new moon) and the other rhodiumized (to simulate the illuminating effect of the Sun). This watch is certainly the only one of its kind and should offer its 30 future owners a way to follow the maneuvers made by the crew of their yacht, the name or motto of which may be engraved in the plaque positioned on the side of the watch-band to make it truly unique. looks stunning on your wrist! I met the gentleman who will take delivery of no. 1. For me, the time on my wrist was short, but much appreciated!